Your friend/family network is one of your most important assets during engagement. 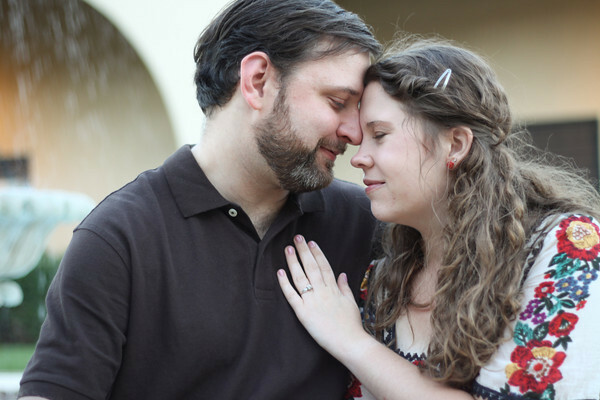 And a great way to save when wedding planning is to ask favors from these talented people. It saves you time, money, but also stress because it surrounds you with the people you care about and trust in this important time. I asked a close friend in our college group who has experience working in salons to do my hair. I loved that I could be honest with her about what I liked and wanted. 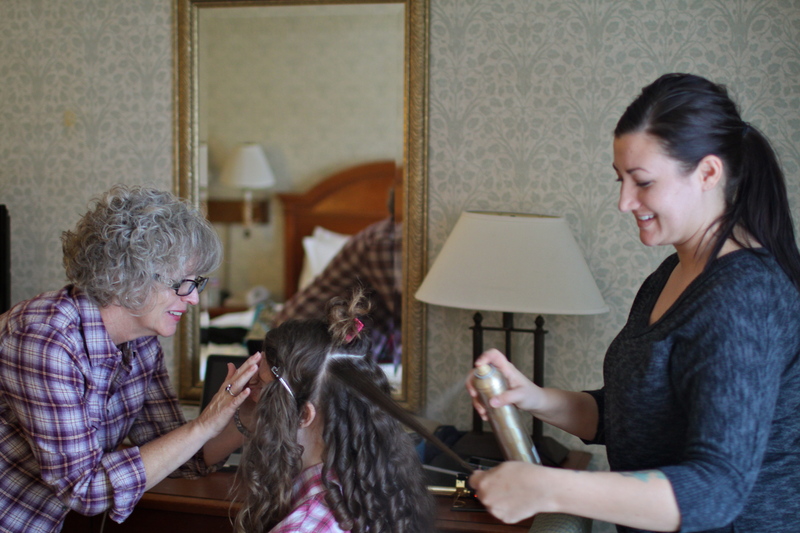 It was nice to have someone I enjoy spending time with curling my hair the morning of the wedding and styling my hair in the bridal room. I am grateful I got to skip the hair salon all together. I also asked a good family friend to make my bridesmaid gifts. She is an esthetician but her hobby is to make crystal jewelry. We met up at a Starbucks and talked through the designs and sizes for bracelets. 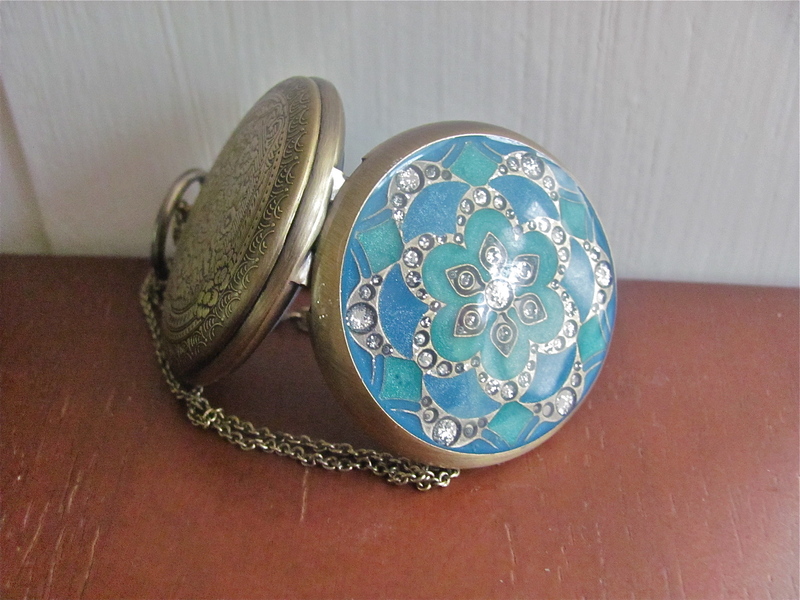 The end products were dark purple glass bracelets with golden clasps. She went above and beyond what I asked, making purple dress-shaped gift bags for each bridesmaid. 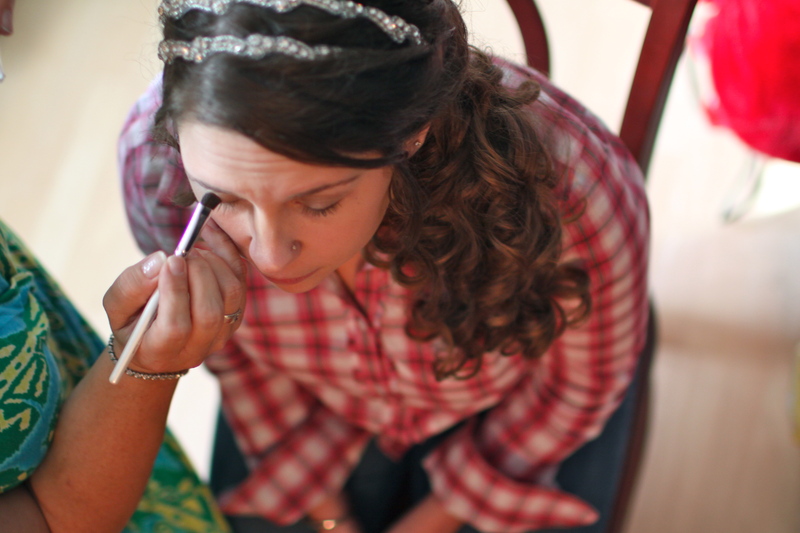 I enlisted another close family friend who is a Mary Kay consultant to do my makeup. We love to talk and laugh and could honestly share with her what I wanted. I was glad to avoid a high fee for a makeup artist or a trip to the mall. I was able to ask a close friend to do my photography. She had done several weddings and engagements before. I am a little camera shy and especially when I’m expected to be affectionate in public while photos are being taken. But it helped that I knew her so well because eventually I relaxed and learned to be myself around the camera. Our photographer suggested we rent out video equipment and have someone we trusted film it. So we asked a trusted friend in the college group to do the video for our wedding. He knew the photographer so they worked well as a team. 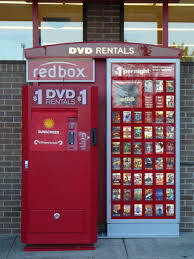 Then the photographer and her husband edited the film, made copies, and mailed the DVDs out. Last of all, we chose to ask my great uncle to preform our wedding (he helped my great-grandfather preform my parent’s wedding) but due to his busy schedule he didn’t think he could come. 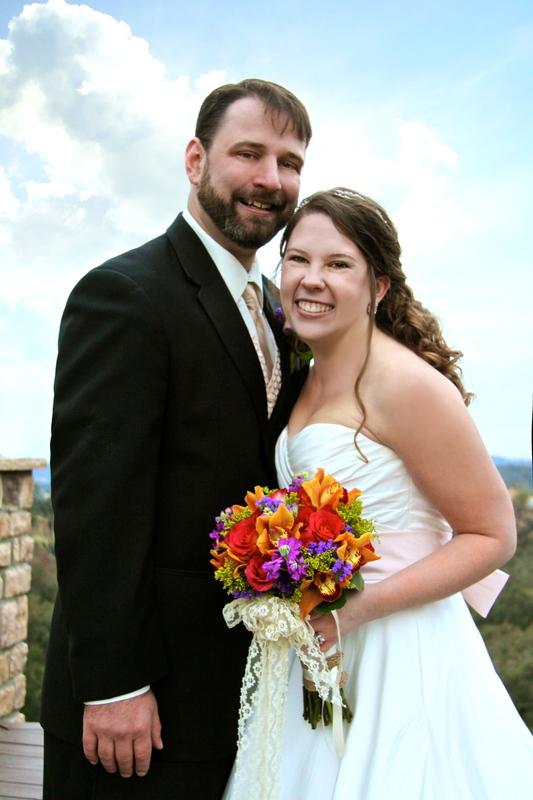 While we were at lunch with his family his daughter , also a pastor, offered to be our officiant. 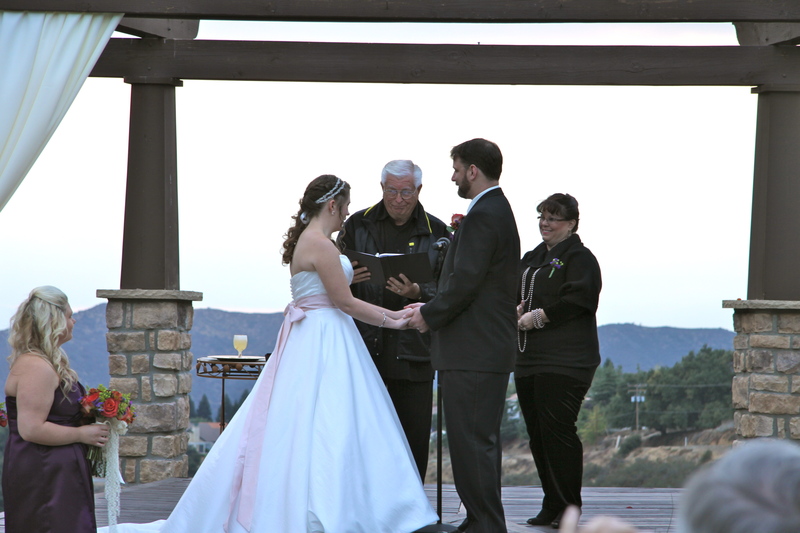 We met up with her and her husband for some awesome dinner and talked through the ceremony. She got to know our hearts and personal story. In the end we were able to keep up a family tradition and my great uncle did get a chance to come and do our communion and prayer time. You may be thinking . . .well I don’t have a network with those talents. But you may have friends and family with other talents. What about cake decorating? or catering? Maybe they are good with arranging flowers? 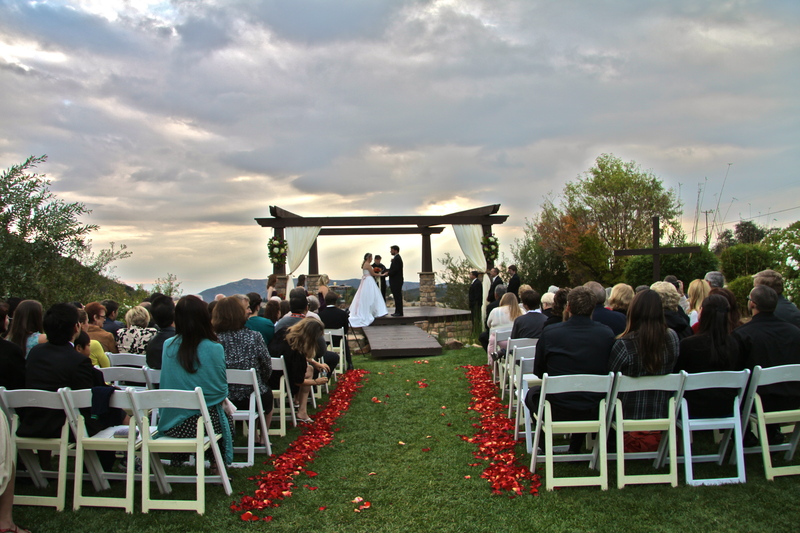 Maybe you know musicians who would love to preform at the wedding? or who are good with a sound board who could be your MC or DJ? Or maybe they are just good at organizing details. If you can trust them and they have expirence-ask for their help! If you can’t ask them to do a large favor, there are still many little things that can be delegated out. ( Stayed tuned for more on delegating). Most importantly: Do not forget to say THANK YOU!!!! I am blessed with wonderful family and friends who were willing to help make our wedding day amazing without any expectations in return. But just because they are volunteers does not mean you shouldn’t thank them. We wrote thank you letters to everyone who helped contribute, paid the photographer, videographer, and pastor (and invited them to the rehearsal dinner since they came to the rehearsal). I paid for the supplies for the bracelets, although not for the labor. And for my hair and makeup stylists? Well they got gift certificates for facials from our esthetician friend. It all tied together so well. Thank you once again to all those who volunteered to make our wedding day so special. As I explained last month, one of the first things people think about when they hear I’m allergic to barley is that I cannot drink beer. But my husband Luke has chosen to turn this into a fun challenge. He is finally starting a hobby he has been wanting to do for awhile: home brewing his own beer (as mentioned in wait barley free means not beer right?). As I promised I would keep you posted and I’m excited to say the home-brewing process has begun! 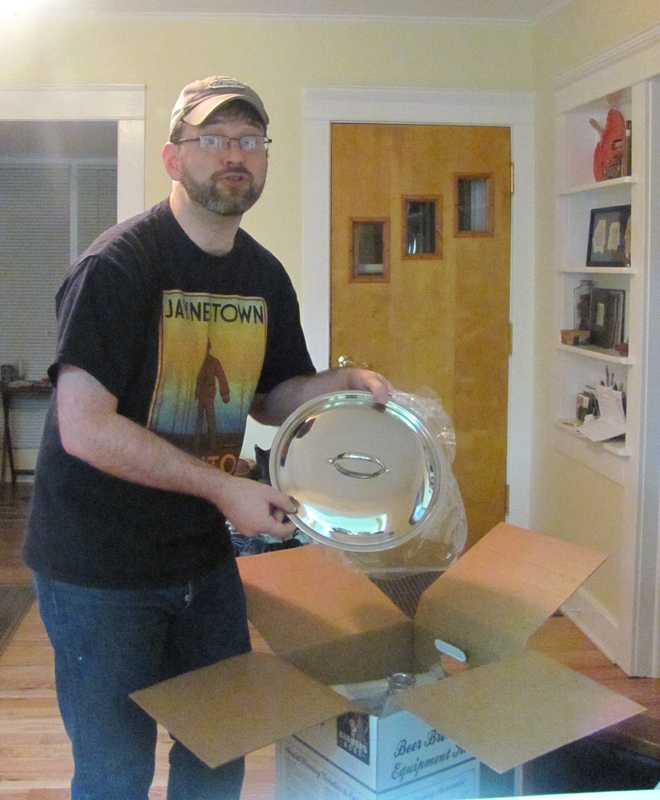 After reading up on the chemical process and visiting the home-brewing store several times to ask questions, Luke decided he was ready to begin. 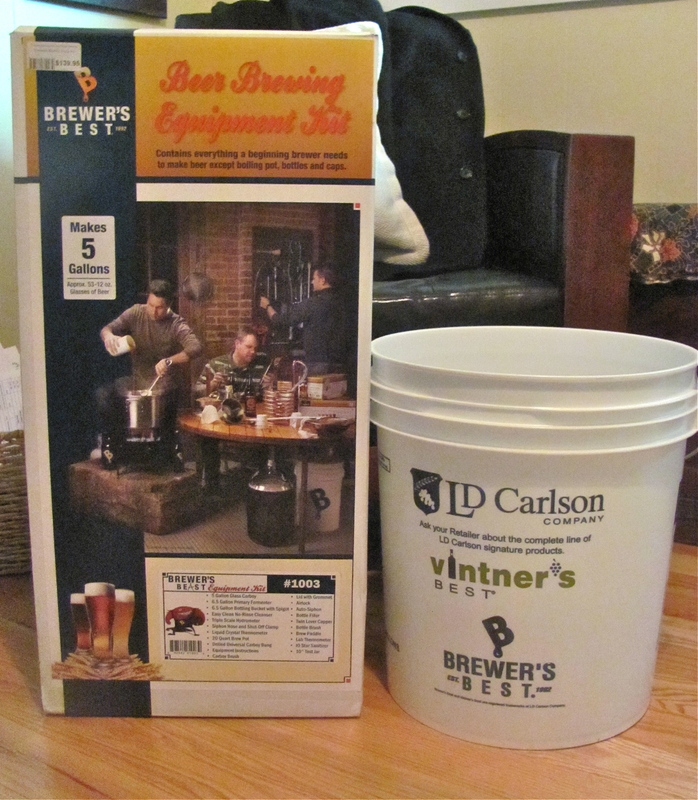 So this past weekend I counted up how much of Luke b-day money was left and with that number in mind we went to the home-brewing store. The first step was picking up the one-time purchase supplies which included: glass carboy, primary fermenter, bottling bucket and spigot, no-rinse cleanser, triple scale hydrometer, siphon hose and shut off clamp, liquid crystal thermometer, 20 quart brew pot, drilled carboy bung, carboy brush, lid with grommet, airlock , auto-siphon, bottle filler, twin level capper, bottle brush, brew paddle, lab thermometer, 10 star sanitizer, and 10″test jar. 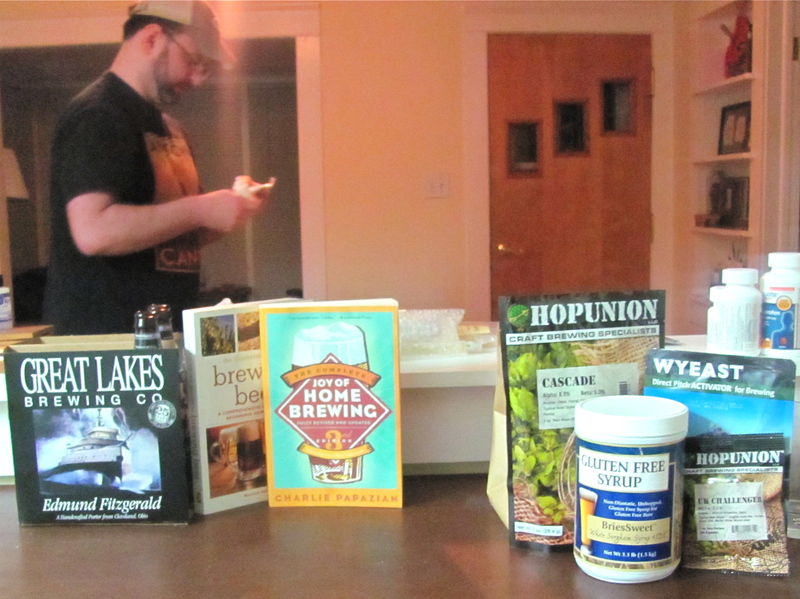 Then it was time to pick out which ingredients to include in the beer. 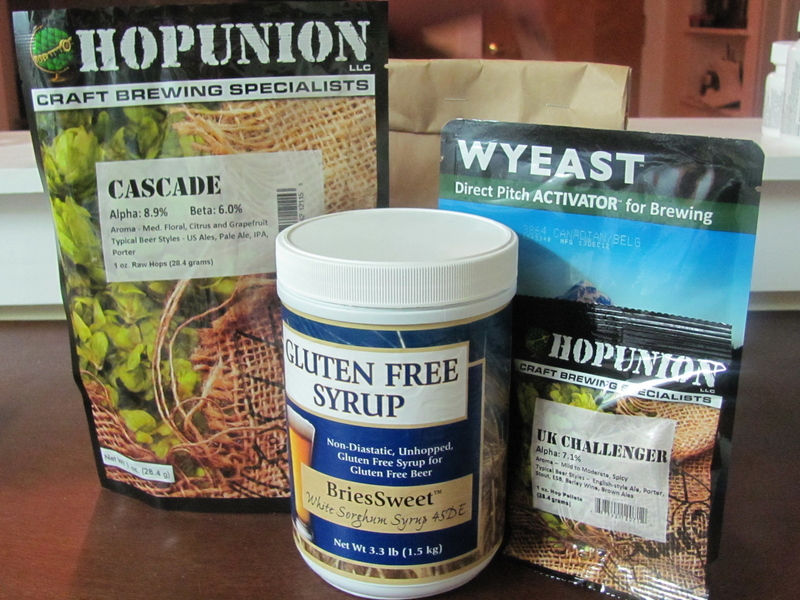 Luke knew what he needed: yeast, hops, a grain, and syrup but of those: what flavor? what variety? how much? 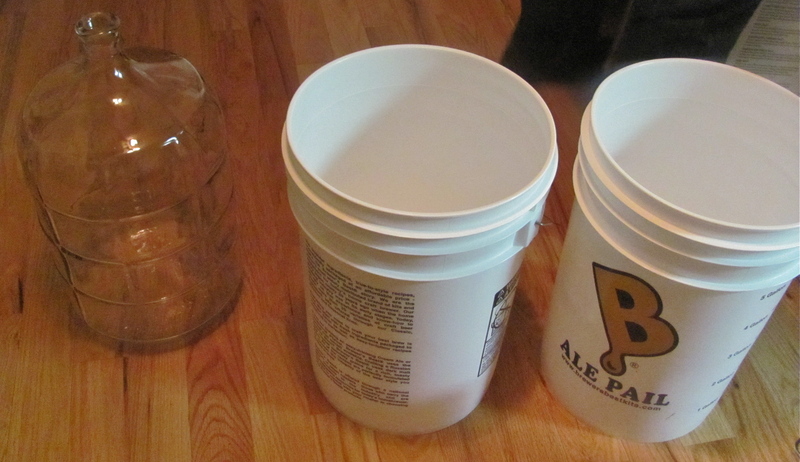 Home-brewing has become a big hobby especially among the gluten-free community. So supplies such as sorghum (which replaces the barley as the sugar /syrup component) are not difficult to find. 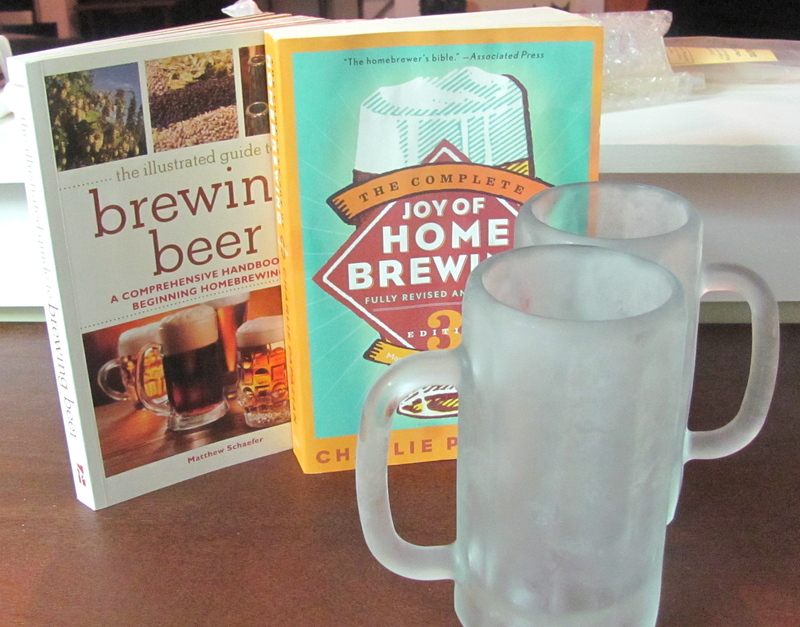 There is a large variety of recipes online and in beer making magazines. The number of which are gluten-free is limited but available. These recipes use replace barley and wheat with corn or rice. But the market for barley-free recipes and supplies is even smaller. See what makes our chemical concoction possibilities different is that I can have wheat, rye, or any other grain that is not a malt aka barley. What we have found though is that most wheat beer recipes are actually 50/50 wheat and barley. So Luke doesn’t have a specific recipe to work off of. As with any food/drink making there is a science to it, but also a lot of guess work. So after checking out the options and asking me what I thought we ended up with: a larger yeast, cascade and UK challenger hops, midnight wheat, and sorghum syrup. This is our first try and we have no idea how it will go. 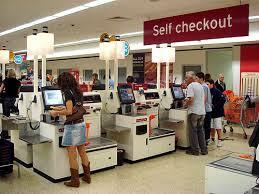 With excitement (and a little hesitation) Luke gave me the look of “here we go” and we took everything to the register. This weekend we will start putting these ingredients to work. I don’t know as much about the process as Luke, but as his designated “beer-making helper” I’m sure I’ll learn. And as before I’ll fill you in on how it goes. Any of you trying a new challenging hobby? Do you like to experiment with new recipes? All the movies make it seem as though that walk or drive off into the sunset with the love of your life is the end no more conflict, no more challenges, no more changes. You relationship is not complete when you get married. You don’t stop working on it after marriage you are only really beginning. With all the awkward superficial barriers worked through during dating, you begin to hit at deeper bigger issues. These issues can come on with the smallest of topics. But if you take the opportunity to openly and honestly talk about them you will find yourself work through things that are much deeper. When you work out issues in an frank yet loving way you learn a lot about yourself, a lot of about your spouse, a lot about what “you” as a couple looks like. The first two months of marriage included a lot of talking. . . and I mean a lot. These talks came up at the most unlikely and most annoying of times too. 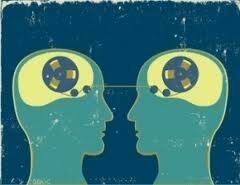 Every time we didn’t agree or were confused by what each other meant or expected we took the time to work it out. It wasn’t easy but we wanted resolution, we wanted to understand each other. There was a lot of questions for clarification: What did you think I meant? What do you want me to do ? What do you think I expect you to do? I found that you may finish each others sentence when you’re dating but it doesn’t mean once you’re married you will be able to read each other’s minds. Another title for this could also be: new is new is new is new . . . This is just the beginning to married life. Any new element is exactly that a new element. So any new topic or area of life not present before marriage is not magically resolved out of your love. Whether it is deciding on when/where it is ok to flirt with each other (or let it lead to more), what to eat for the week, who does what chores around the house, the budget, outings, etc.. If it is a new decision it requires talking it out-it requires work. Remember back when you felt unsure how the person you were dating was going to take your opinion on an issue? Or you were unsure how to bring a new difficult topic up? But in time you develop trust and with it comes honesty, patience for each other, and grace to see eye-to-eye on things. Well that doesn’t change. You will still have those awkward and difficult conversations for anything that is a new element to your relationship. 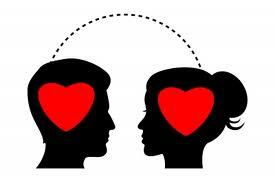 New elements to your relationship require effort and compromise to make new decisions. 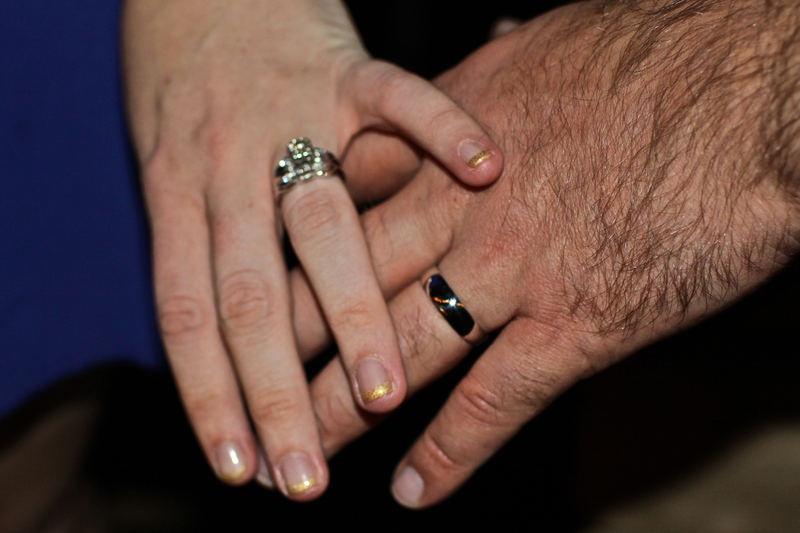 It doesn’t happen through osmosis when you put rings on each other’s fingers. It comes through loving each other enough to want to work it through. Don’t out of fear of being vulnerable keep your mouth shut when things bother you. But don’t go overboard either. You do not have always instigate a debate-the talks and challenges will come up on their own. It doesn’t happen over night. Six (almost seven) months married life is a lot easier than one month. The more we invest in each other the more we see growth,stability and we find ourselves deeper in love . Trust me it’s true! Marriage does not grow like weeds. 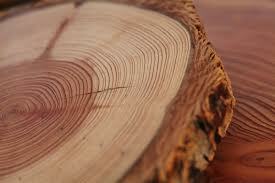 It grows like trees-change sometimes is subtle but time and consistent investment can make it grow stronger. And if you think you’ve been through a lot as a couple before you get married just wait until you watch the other person step-up to the responsibilities as husband or wife. You will love and respect them even more. I do not claim to have this figured out-we are still working through a lot of topics and issues. But I know that going into the first few months being willing to ask the hard questions knowing you are safe to be vulnerable (that the commitment you made to each other is enough) makes all the difference. You have to know that the other person loves you and will show you forgiveness. That they (and you) will be willing to say your sorry, mean it, and move on. There is a lot of adjusting to do and it requires compromise, patience, and grace. Wednesday nights we have been going to a budget class at church. It has been helpful to get Luke and I on the same page about where/how we spend, save, and invest. But the class starts at 6:30pm and Luke often doesn’t get off work until 6:00pm if he is lucky. In an effort to save money, and our health, on these busy weeknights I make a one dish dinner. So as Luke drives home from work I quickly put together the meal so by the time he comes in the door I’m ready to grab the lunchpail and head to class. There are several meals I can make from home quickly. 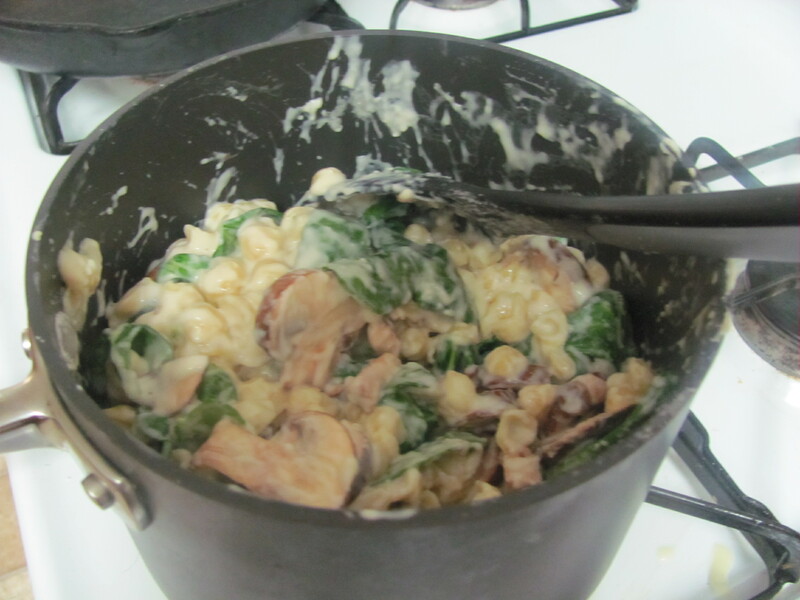 One of them is mushroom and spinach white cheddar pasta. 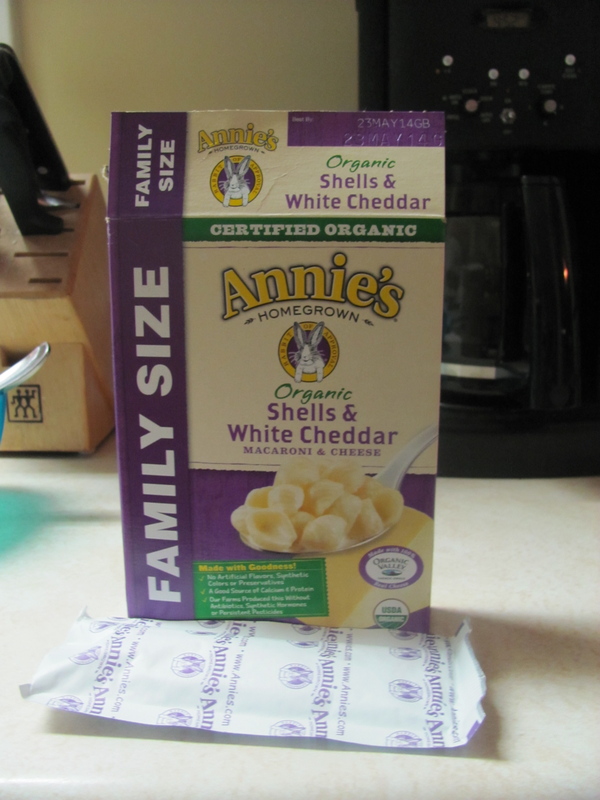 For this meal I actually use a box of Annie’s shells and white cheddar. I don’t often use boxes, but with simple ingredients like this, how can I go wrong? 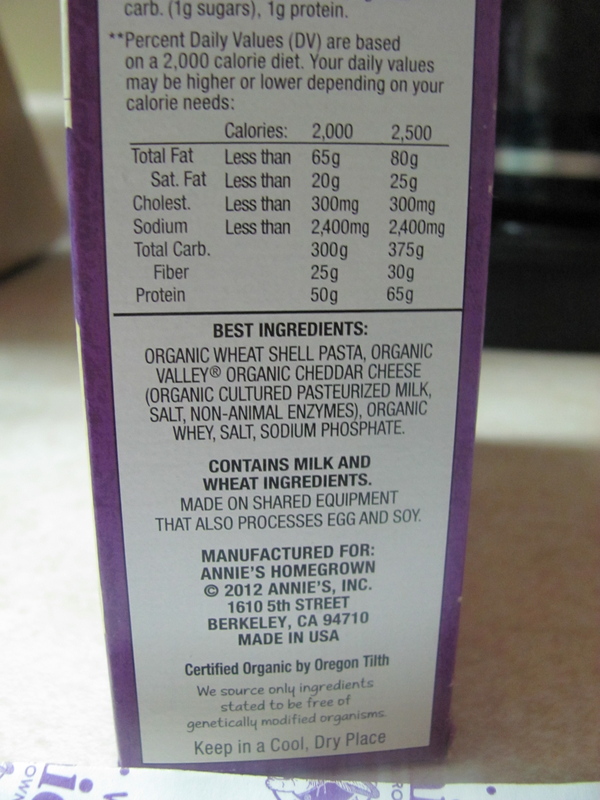 Annie’s has many organic products. 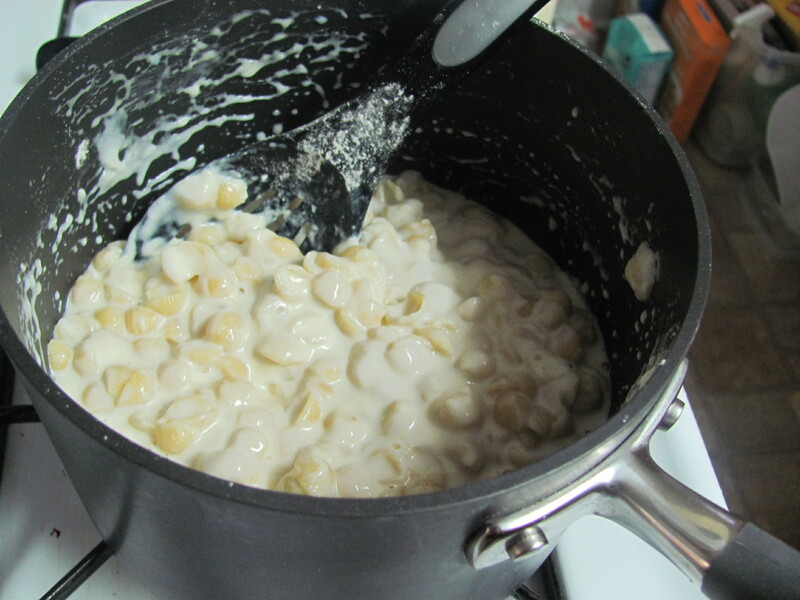 They also have gluten-free rice white cheddar shells that are just as tasty! 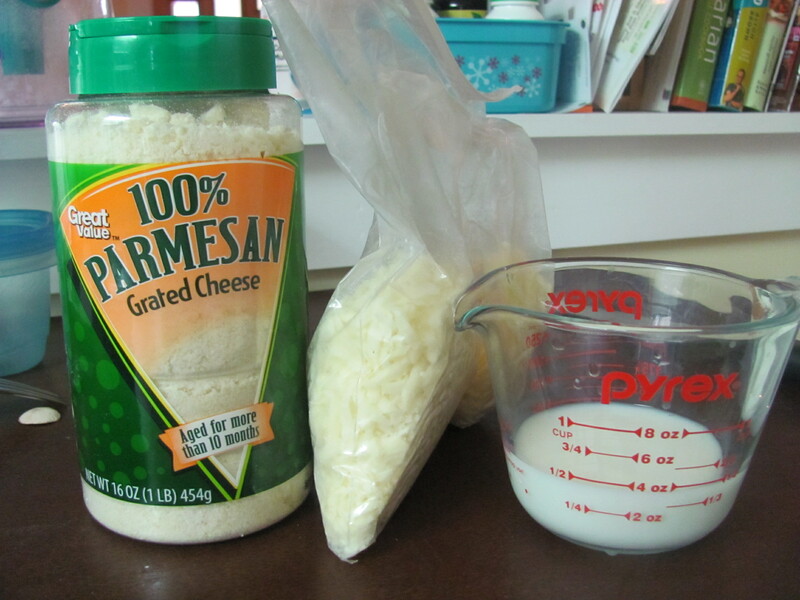 After cooking the pasta I add the packaged sauce, a little milk, parmesan, and melt in some mozzarella cheese. 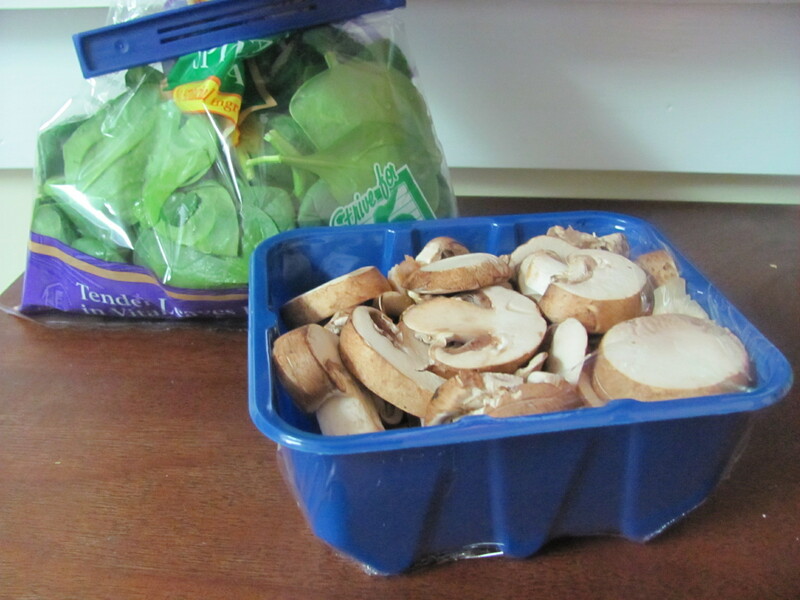 Once the cheese has melted, I add in the mushrooms to cook until tender, then last of all the spinach. 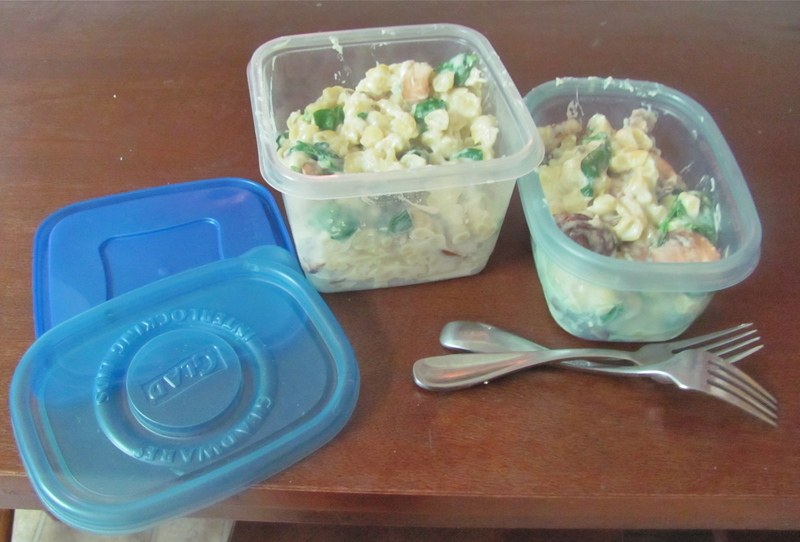 Once it is all cooked and warm it goes into the tupperware containers (Luke is the bigger one). 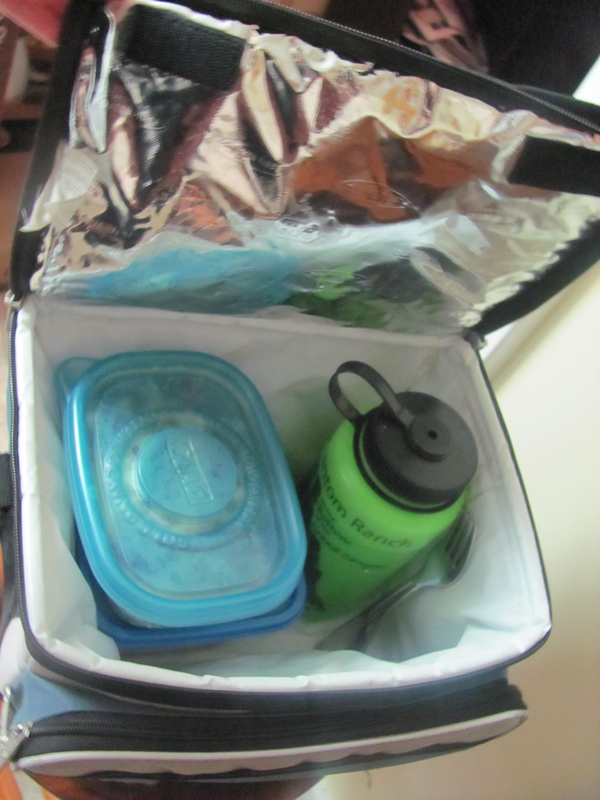 Then I fill up a bottle of water to share, thrown in some napkins, forks and dinner is ready on the go. Plus when I get home there isn’t a huge mess to clean up. Just one pot and our tupperware. Sometimes it is fun to make challenging new recipes other times you have to do what is easy, simple, and fast. 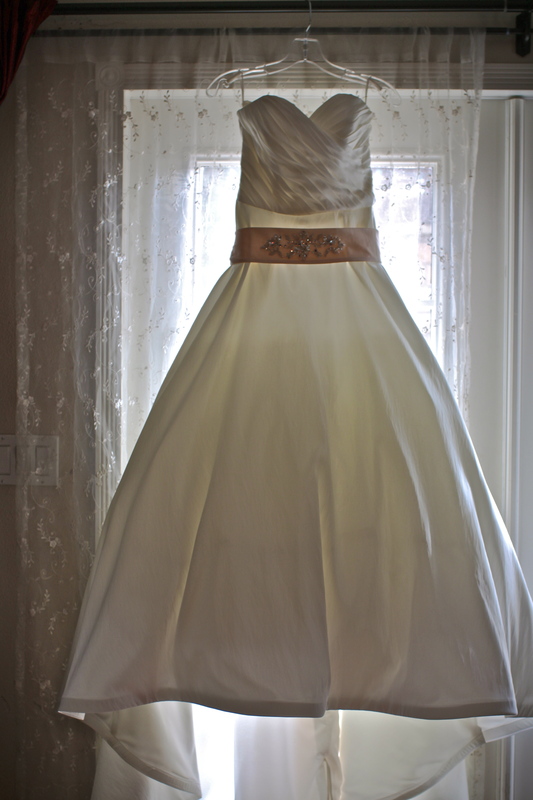 The Wedding Dress. It is the most expensive dress you will ever wear and the one you will have pictures of forever. But without direction, shopping for a wedding dress can be an exhausting and frustrating. Here are a few things to consider before shopping. #1 know you budget and stick to it!!! A. If you don’t know exactly how much you have to spend on a dress you are bound to spend more than you expected. 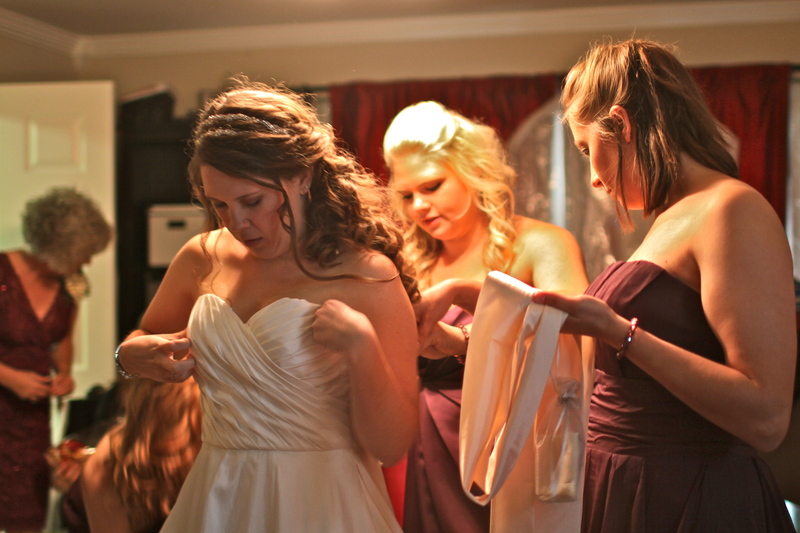 Although workers at bridal shops are extremely helpful and friendly, they are also salespeople. After trying on several “nos” at my first bridal store, out came an off-white dress covered in lace and applique. It was beautiful. Beautiful that is until I heard the cost. So warning: do not even allow them to put you in a dress that you cannot afford-if you are not sure ask them –before you put it on and fall in love. B. Alterations and rush-order fees: Your dress will need basic alterations (hemming and bustling) which can cost a pretty penny. If you need the dress to be pulled in somewhere it will cost extra. Each place has a different rate/policy about alterations-so ask for an estimate. 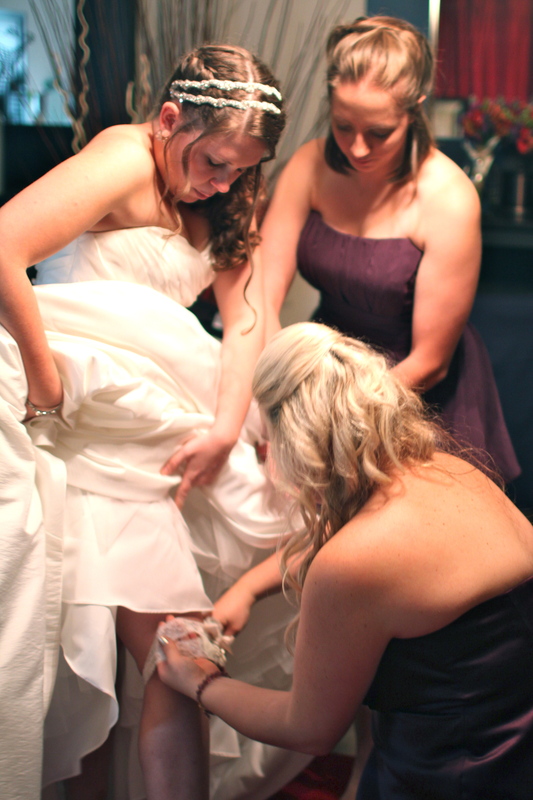 It is still important to have your dress altered by professionals; trust me it’s worth the money. Also know your timeline. If you are going to have a short engagement (like I did) you will probably have to pay a rush-order fee. Bridal shops expect you to come in 4/6 months prior to the wedding. When your engagement is less than that you are already behind in their mind. So tell them your wedding date and ask if/how much a rush order fee would be. That may determine which dress you can afford. Hint: For all of this it may be helpful to bring along a calculator . Don’t be afraid to ask questions and don’t forget about taxes!! 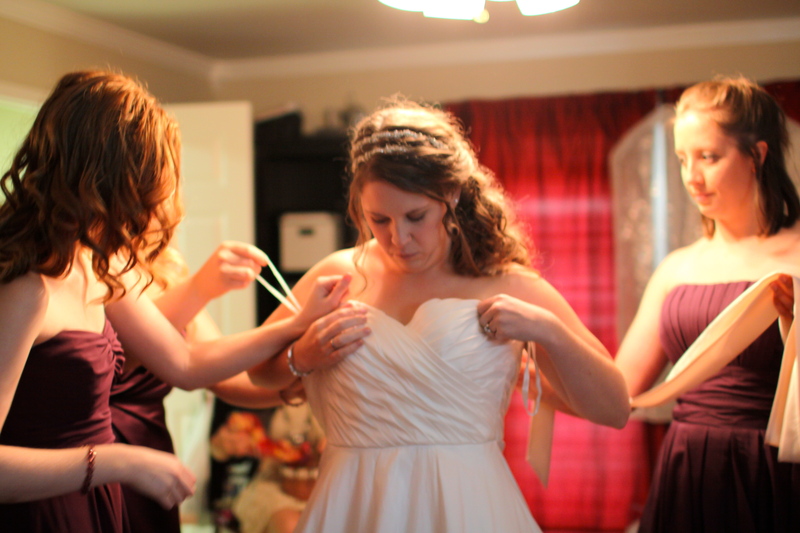 For example, during alterations I asked for a layer of tulle to be removed from my modified/mini ball-gown. When I saw the dress pressed it still looked very full. At my outdoor evening wedding reception, the tables and were chairs close together. Because of this and how full my dress was people ended up stepping on it, pulling the bustle out. After awhile this became pretty frustrating. 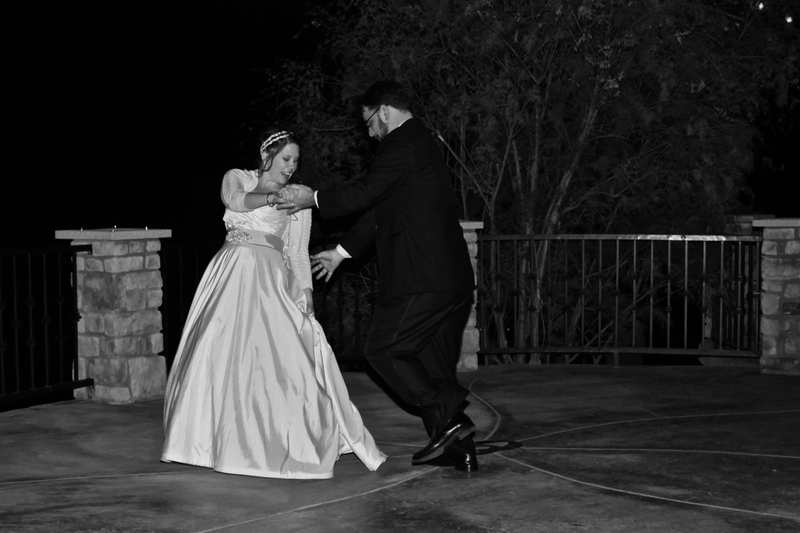 So much so that I convinced Luke to not twirl or spin me too much for our first dance for fear I may trip and fall. 1.Buy used or vintage. It know you want your own special dress. But who said a used or vintage dress can’t be special? 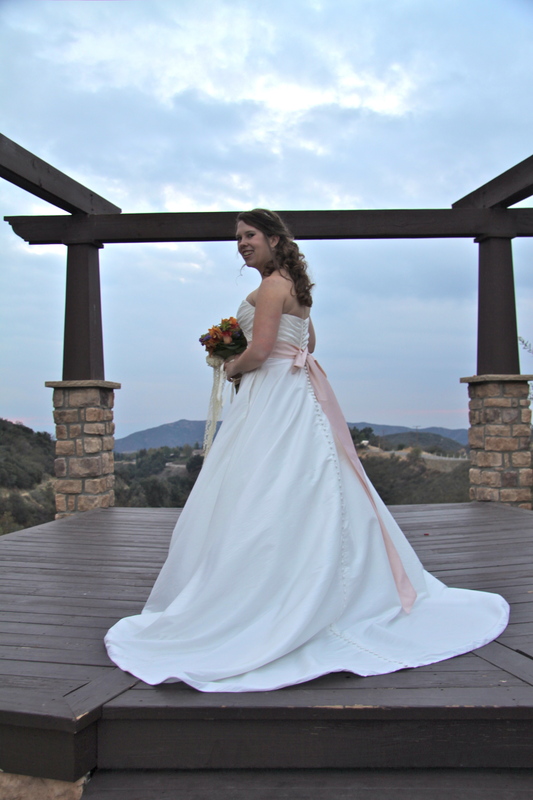 The dress can be altered (by professionals) and it will look totally different on you than a previous person. With your wedding, your accessories, no one will care or need to know! 2. Buy off of the sample rack. Some bridal stores have a separate corner where sample dresses are sold. 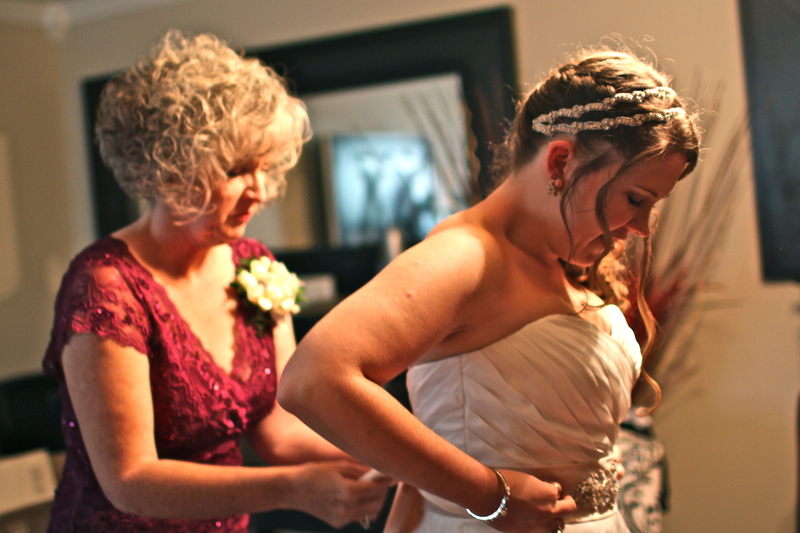 You may wonder about their condition considering how many brides-to-be have tried them on. But for hundreds instead of thousands a small repair in addition to professional alterations and cleaning would be worth it. The bridal shop where I got my wedding dress had sample racks next door. I looked at styles and tried a few things on from different price ranges. Doing this helped me discover I could afford something similar next door. You will save yourself a lot of dressing rooms if you know what style of dress you like and what flatters your shape. There is nothing wrong with loving the style of a mermaid or trumpet dress but if you are like me and do not have a long torso or narrow hips you may not be happy with the outcome if you try it on. Likewise if you are short or petite a formal ball-gown could swallow you up. This is not to say you shouldn’t choose these options. You all have beautiful bodies and you want them to look their best. So pick a style you are comfortable with and feel flattering in. Although I looked good in a lacy A-line they were more expensive and I was a little self-conscious of how prominent my hips were. So I opted for a modified ball-gown that flares out at the waste. If you need help determining your shape and style check out real simple wedding dress: “perfect dress for your body type”. Where you are getting married and during which season will also make an impact on your dress choice. You do not want to wear a heavy beaded ball-gown at a beach wedding in August. Or a tea-length lacy dress for a winter formal church service. 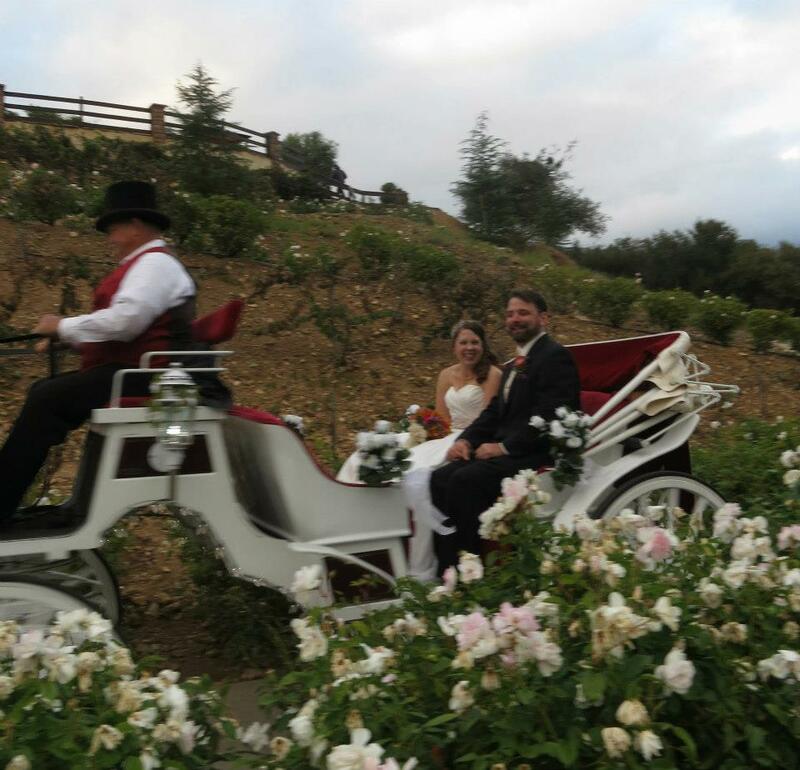 I arrived and left the ceremony site by horse drawn carriage. It was a little challenging with a large dress to find the seat and my dad (arriving) and Luke (leaving) had to support me so my slippery dress didn’t cause me to fall out as we went up/down the hill to/from the wedding site. 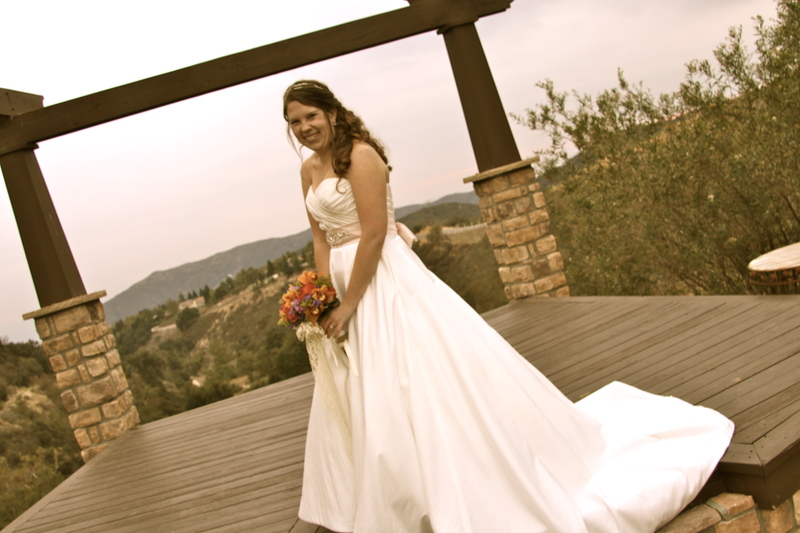 It was a small issue but your ability to get around and feel comfortable in your wedding dress is important. My dress was perfect for me. It it had pockets, a sweetheart neckline, plunging back, embellished blush ribbon, and pearl buttons all the way down the train; simple and classy. I know there are many beautiful options out there. 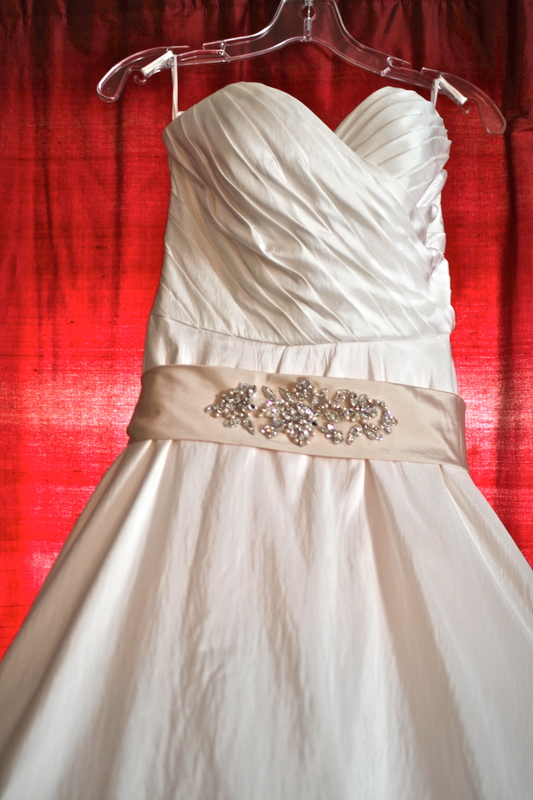 My hope is this blog has helped you get one step closer to finding the perfect dress for you. We live in an impatient world. We are used to instant gratification or easy access to all commodities we would need (and almost all we would want). We are constantly being told we deserve the best, fastest service in every industry from drive-thru coffee, vending machines for movies, to self-checkouts at grocery store. This makes it rather difficult to teach, learn, or live-out any form of patience. Patience is more than a virtue-it is a mostly forgotten way of life. There are many areas I desire to learn to live out patience, but today I am writing about patience with myself. As you probably know by now, I am working on transcending this issue of self-judgement. (see self-judgement a story definition) I wrongly accuse myself for circumstances out of my control. I expect the world of myself. So you can imagine I do not show myself much patience. The truth is, I was not ready to take on the world the second that we moved. I needed time. Time to adjust to dramatic change, to let go of the life I had in California. Time to embrace life here in New York, to adjust to married life away from family and friends. Everyone told me to embrace this break, to enjoy it: after a chaotic year I deserved it. But that was hard for me to hear. I love having a schedule, having routine, feeling involved and connected. 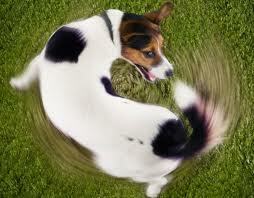 Once I began to embrace the time I had, a flexible routine formed. Now six months into marriage and more than 5 months here in New York, some of my expectations have been fulfilled; (see spring is coming) the home is (mostly) set up, the name changing paperwork complete (see Becoming Mrs. ____________), and we are getting involved in church. Still my patience is being challenge all over again as I work through job searching. 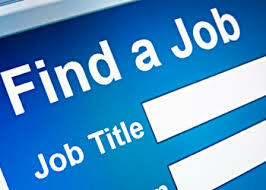 It is a challenge to find a job in a state where you have no connections. Job searching feels often like a rush and waiting game. You find a position you are interested in, you turn in the paperwork and forms-then you wait. If the door closes then you start over. If the door opens you set up time for an interview and wait. Then you have then interview and wait. It can be an exhausting process of elimination. At times I worry about having a more than 6 month long jobless gap on my resume. But I have to believe the right job won’t care. I have to keep moving forward toward what is right in front of me. 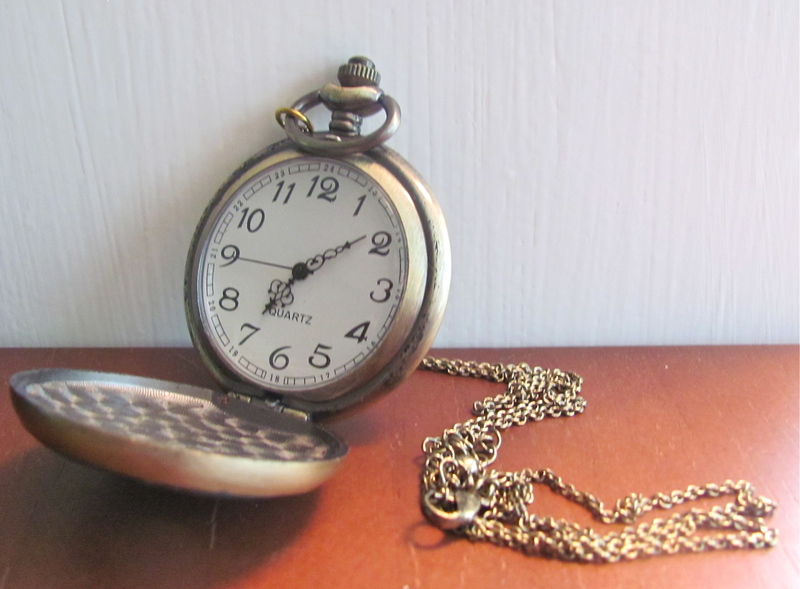 What I struggle to see is that giving myself time is not wasting time. By not insisting that I accomplish my daunting list of expectations right away, I learn flexibility, to not try to control what is out of my control,to trust, and that time to learn more about myself is a blessing. 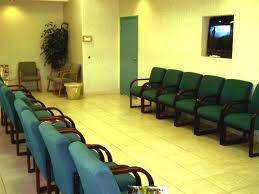 Being patient with myself is recognizing the time in the waiting room is not wasted. Giving myself the gift of time helps me understand myself better and it is in the waiting that I am prepared for what I am waiting for. Any of you waiting on something important? Do you struggle with our instant-gratification society? In what area of your life do you want to learn patience? We all have those nights. Sometimes once a week, or every other week, where there is enough food left over in the fridge to make a meal. So we get creative and have a mismatched dinner. The Greene’s don’t often make big enough portions of any meal for it to be “left over” for long. But we will have veggies or fruits left unused from the past week’s meals that are still fresh but need to be eaten soon. These are our leftovers. Usually this occurs Monday night. (After the weekend and before I hit the store). So what do you do with leftover fruits and veggies? We get creative. 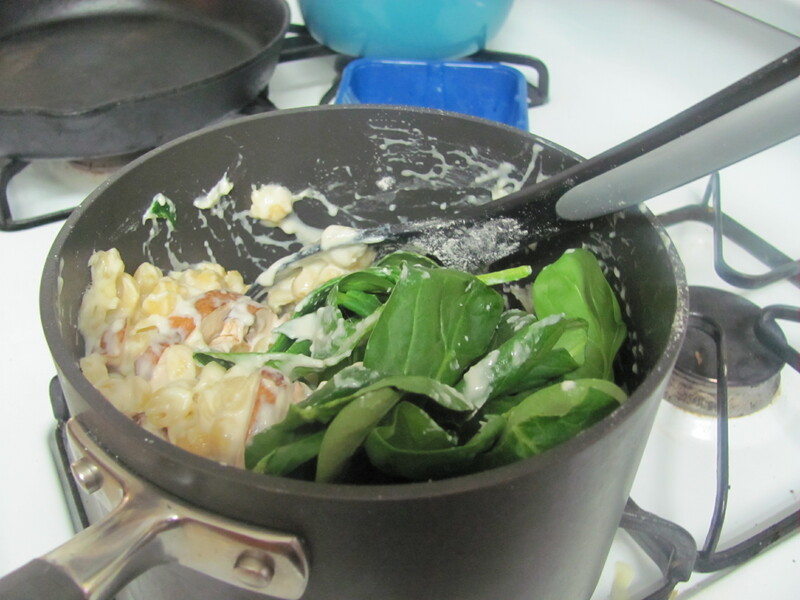 Two common ingredients left over alongside the veggies or fruits are potatoes or eggs (or both). 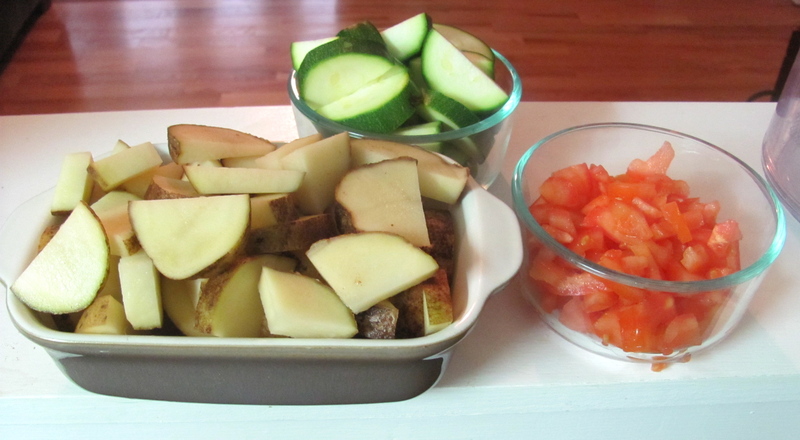 This particular leftover night we had potatoes, zucchini, and tomatoes left in the fridge. 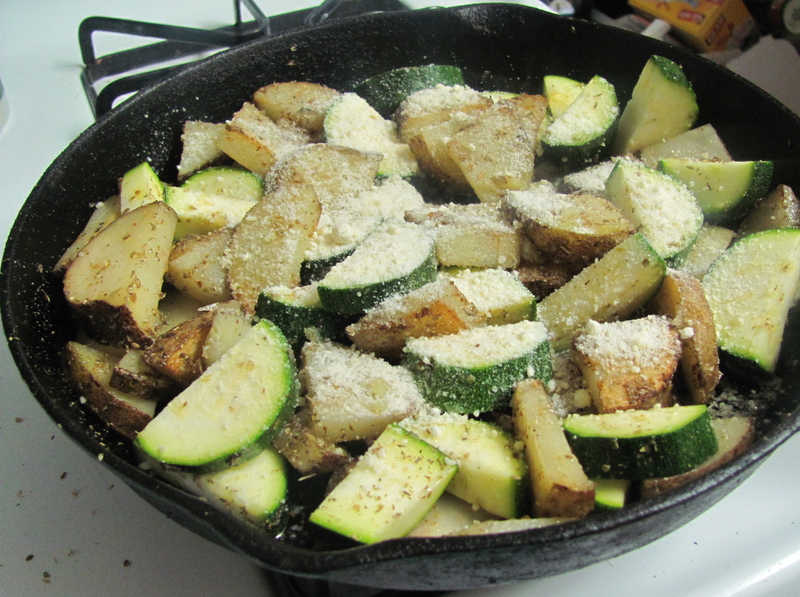 So the zucchini and potatoes went in the cast iron skillet with some parmesan and olive oil to pan-fry. 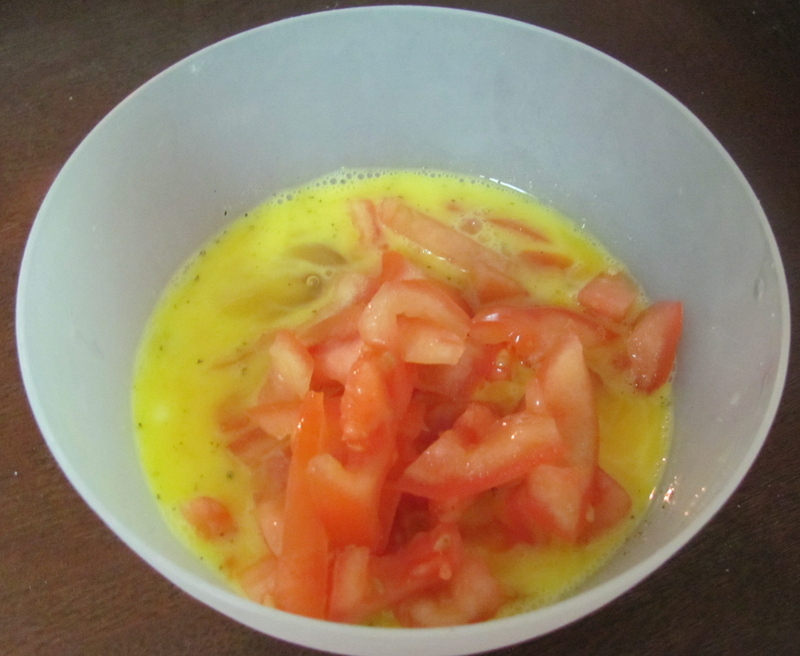 I then mixed the tomatoes with garlic, pepper, salt, and beat in a few eggs. 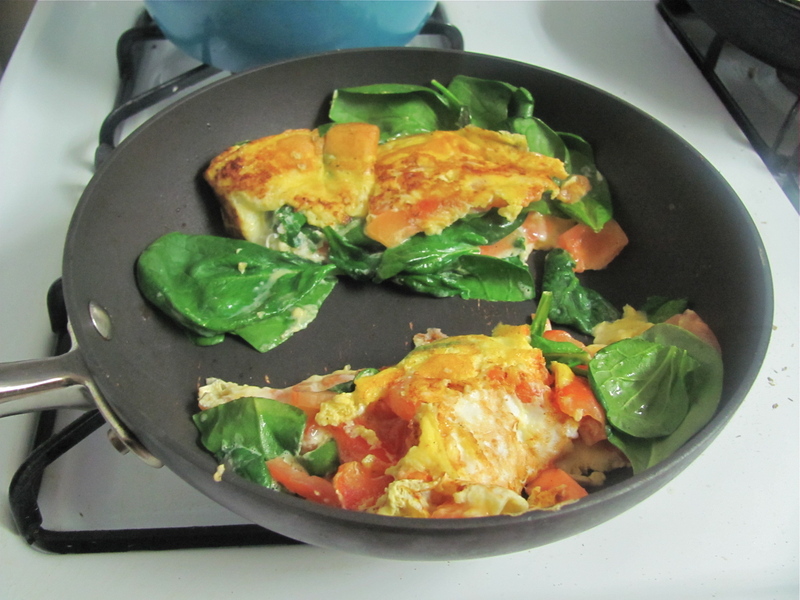 Then I poured the egg mix into a pan and added spinach and cheese, making a messy (but tasty) omelet. 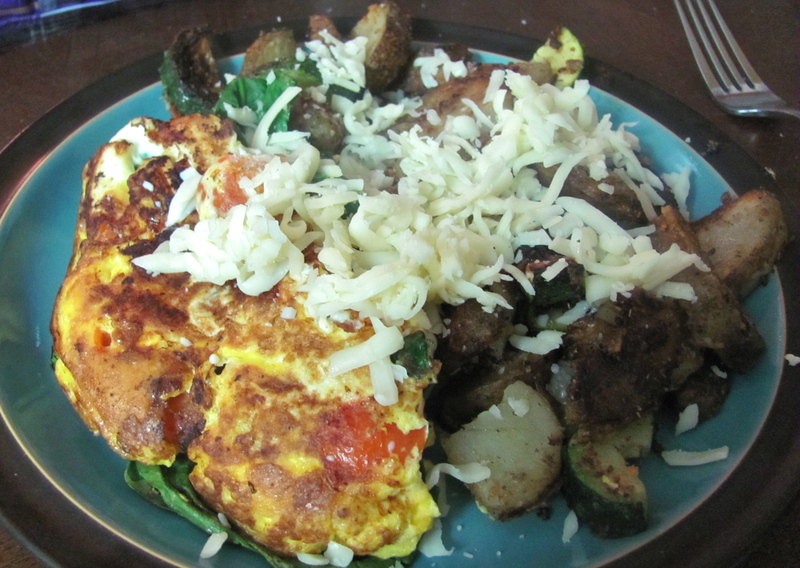 Together it made for a easy brinner (breakfast for dinner) veggie delight. This is not our only leftover meal. If we have pasta and sauce, then it is a veggie pasta dish. If we have an abundance of potatoes, we eat baked potatoes with a steamed veggie medley on top. 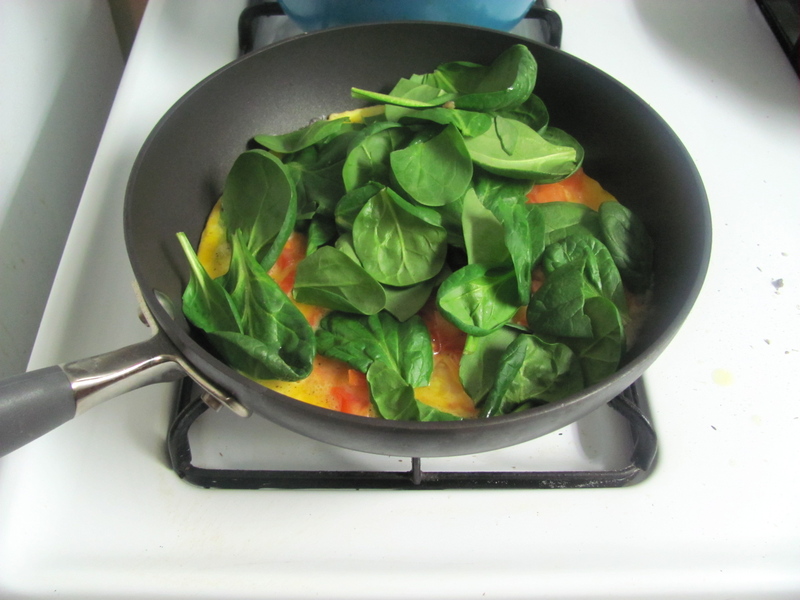 If it’s eggs, we make an omelet or scramble. If there is fruit, then we have a berry salad or a smoothie for dessert. The options are endless. As I come across more I will try to post them. Our leftover meals are almost always vegetarian, barley-free, and sometimes gluten-free. How does your family define leftovers? What do you do with leftover food in the fridge? What is your favorite creative leftover dish?